The winner of the Hahnenkamm Downhill 2017 is Dominik Paris! The Italian conquered the Streif in 1:55.01 minutes, beating off the two French athletes, Valentin Giraud Moine (+0.21) and Johan Clarey (+0.33) in the process. This is the second Downhill triumph for Paris in Kitzbühel since 2013. „I didn’t ski that well in the top section, but it was a super run from the Hausberg down. My knees knocked a few times on the way though“, said the smiling winner. “It is one of the nicest races that we have, if not the nicest. I always look forward to taking part here”. "There is going to be a big party", announced second-placed Valentin Giraud Moine. "I felt good out there and put my foot down. It is every downhill racer’s dream to stand here on the podium", said the Frenchman. Team colleague, Johan Clarey, was also exuberant: "I love skiing here in Kitzbühel. I am an „old hand“ at this now, I know how to tackle the tricky sections here." 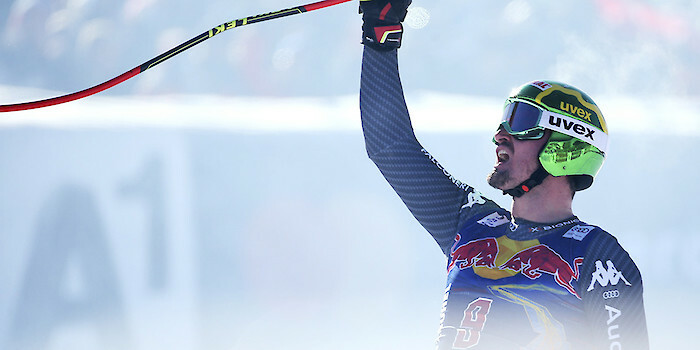 Super-G winner, Matthias Mayer, is the best Austrian in eighth position (+0.75 seconds). „I was unswerving in the top section, but lost time down at the bottom“, said the Carinthian athlete. Bad luck for Franz and Feuz As in the Super-G, a serious mistake thwarted Hannes Reichelt’s (AUT) efforts. Despite near-elimination, the Streif winner of 2014 still managed to finish ninth. „I actually considered stopping after making that mistake. But I wanted to cross the finish line and enjoy the whole ambience. The lower section was brilliant to ski. It surprised me at the end that I was still so close to the leaders“, said Reichelt. Val Gardena winner, Max Franz (AUT), lost a ski immediately after the first split time section and was eliminated. „I am glad to have crossed the finish line in one piece. It is annoying. The binding is set so that it opens in an emergency, but I didn’t have an emergency today. I was having a good run, it is a terrible shame“, said the Carinthian athlete. Switzerland‘s Beat Feuz was seven tenths of a second in the lead at Hausberg, before he came a cropper in the Traverse and was unable to prevent a fall. The final results to download here.